Private lessons are tailor-made for you – whatever you want or need to develop, our team will ensure you get the most out of your time on skis. We can offer one-to-one coaching or you can share your session/s with friends who are at a similar level. Private lessons can be on or off-piste and for coaching or simply for guiding. Perhaps you’re looking for a refresher? Or a couple of hours to build confidence on the terrain you’re finding most difficult. Keen to ski Serre Chevalier’s famous larch tree forest? Why not try something different altogether and learn about avalanche safety? We have many possibilities for you to enjoy with Gavin and his team. Our private lessons are designed and tailor-made for you, so have a think about what you want to achieve, or maybe where you want to visit in Serre Chevalier or even Montgenevre or La Grave. We can teach specific skills, or help you find the best snow (on or off-piste) and show you where we love to ski! For private lessons, we can meet you anywhere within Serre Chevalier or a nearby resort, subject to availability and our schedule timings. We do not currently teach snowboarding in Serre Chevalier although we can recommend someone who can – just ask! Coaching or guiding. On or off-piste. You decide. Lessons tailored to meet the needs of your party. *Prices are for 1-2 skiers with an instructor. 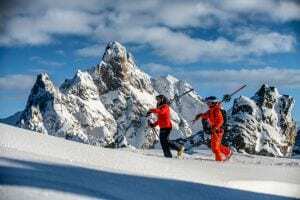 A supplement of 10€ per hour per person is payable for additional skiers, except for the all day private coaching option where a supplement of 50€ per additional skier is charged. Subject to availability, we can meet you at any of the lift stations e.g. 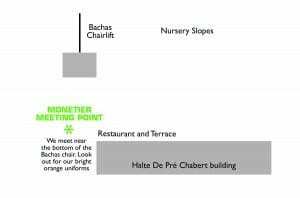 Monêtier (our main base, at the bottom of the BACHAS chairlift), Villeneuve-Le Bez (at the bottom of the Fréjus bubble), Chantemerle (outside Café Soleil, Ratier) or Briançon (Prorel). During peak weeks e.g. February Half Term, we ski from our Monêtier meeting point. We need to know at time of booking if you’d like to meet somewhere different for your lesson (so we can check if any adjustment to the schedule is needed).